Prem Narayan Shrestha of Sallaghari Community Forest Users' Group in anthali, Ramechhap shows the first pine tree felled as part of a scientific forest management program. Nearly one year later, the houses that went down in last April’s earthquake are still in ruins along the banks of the Tama Kosi. None of the 200 families living in temporary huts here have begun to rebuild their houses. They are all waiting for the first installment of the Rs 200,000 grant to be distributed by the National Reconstruction Authority (NRA). But there is another reason they haven’t rebuilt yet: the shortage of timber. 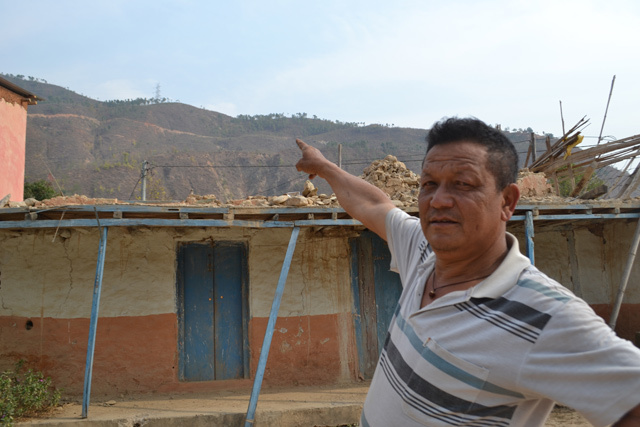 Babur Jung Shrestha shows his community's forest that has thinned because of drought and encroachment. 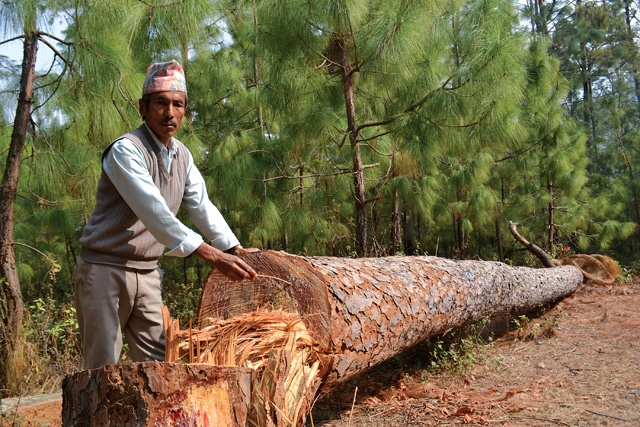 “Our community forest has thinned because of drought and encroachment,” says Babur Jung Shrestha, a member of Gadwari Community Forest Users’ Group (CFUG) near Manthali. Villagers are now dependent on other community forests for timber for the nearly 35,000 houses damaged by the earthquake in Ramechhap. A preliminary study by the Ministry of Forest (MoF) shows a severe shortage of timber for reconstruction in 11 of the 14 earthquake affected districts. Only Rasuwa, Makwanpur and Sindhuli have sufficient timber for post-earthquake reconstruction. In neighbouring Dolakha, the epicentre of the 7.3 magnitude 12 May aftershock, survivors have salvaged wooden poles, beams and planks to rebuild their houses. They can also get more timber from private and community forests, but they are worried about the shortage of hardwood timber needed to build doors and windows. Krishna Bahadur Basnet sits in front of his earthquake-damaged house in Dolakha. He says he also wants timber from the government apart from the reconstruction grant. A model of earthquake-resistant building in Japhe, Dolakha. Building earthquake-resistant houses, like this one, requires more timber. Fortunately, Nepal has enough forest cover and timber for the massive post-earthquake reconstruction. After the earthquake, the Department of Forest (DoF) carried out an assessment of the need and availability of timber and found that Nepal had at least 2 million more cubic meters of timber for post-earthquake reconstruction. Karki is not for chopping every tree, but felling mature trees in a scientific way to prevent forest degradation and fires. In the last two decades, according to a Forest Resource Assessment (FRA) report released in Kathmandu this week, Nepal’s forest cover has increased by 5.15 per cent. 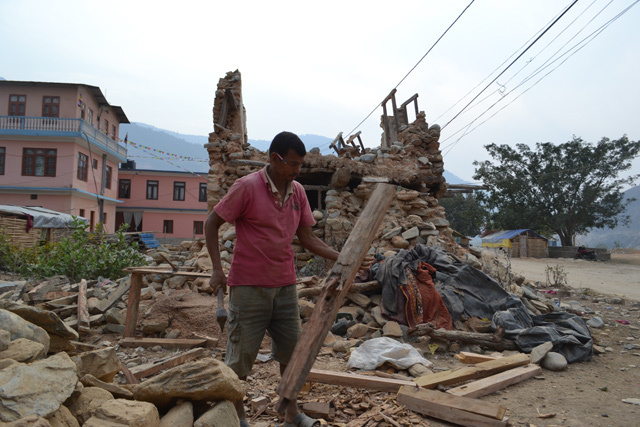 Prem Narayan Shrestha, 55, has been living in a temporary hut in Manthali after the May aftershock last year flattened his house that was partially damaged by the April earthquake. 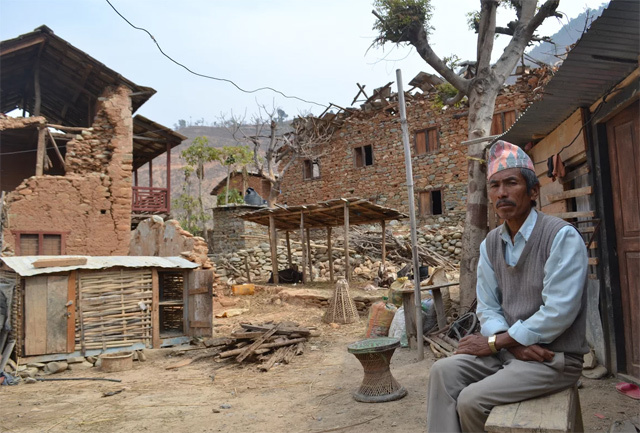 Like most earthquake survivors in this central hilly district, Shrestha is still waiting for the Rs 200,000 housing grant from the government. But as President of Sallaghari Community Forest Users’ Group in Kathjor village he is not worried about timber. In February, members of his forest user group felled trees in one of six sections of the 92 hectare jungle. They will fell 70 mature pine trees for timber for rebuilding. 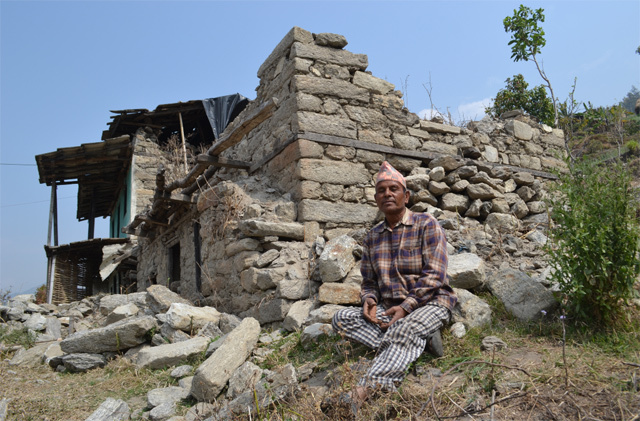 Prem Narayan Shrestha sits in front of the ruins of his house that went down in last year's earthquake. In the last decade, Nepal is experimenting with modern forest management in community as well as collaborative forests. Mature trees are cut so younger ones grow faster. The Ministry of Forest has targeted to get more than 20,000 cubic meters of timber from scientifically-managed forests for reconstruction of earthquake-damaged houses, schools, hospitals and infrastructure. "He was our inspiration,our guiding light."